Second, all attempts I’ve found execute a “hard reset”, which is equivalent to powering the system off then on again. This mod will perform a “soft reset”, which is a software-only reset (the equivalent to pressing the physical “Reset” button on the Genesis). *On a side note, I’m also personally a bit squeamish about actually cutting into my system. While I’m decent enough at soldering, at least if my work comes out ugly, it’s sealed away inside the case and no one’s the wiser. A (very) small number of games require it. X-Men, for example, asks you to “restart the computer” (i.e. physically press the “Reset” button) near the end of its story. It’s a neat 4th wall break, but it also makes the game impossible to complete on the Nomad. There are (supposedly) some multi-game compilation cartridges that require you to press “Reset” to access other games on the cartridge. My choice to use the “Mode” button carries a very small risk. The original purpose of the “Mode” button was to enter a “compatibility mode” when using the new 6-button controller, since the hardware tricks employed by the controller caused problems for a select few older games (this video does a good job of explaining it in depth). Shortly after the controller’s release, however, a handful of games actually incorporated the “Mode” button into regular gameplay, and this is where the rub lies. There’s no complete list of games that use “Mode” for gameplay, and the scarce information I’ve found doesn’t make clear if any games need the “Start”+“Mode” combination. If there are any games that require it, the game will be reset when they’re pressed in combination (the buttons will otherwise be unchanged for individual use). So, as with all mods: it’s up to you to decide if the benefit outweighs the cost (but honestly, I’d be very surprised if there were any games that used this). The primary inspiration behind this mod is a 2014 forum post on krikzz.com (the maker of the EverDrive cartridges). This design is by “princemoonrise”, who added two physical reset buttons, both a “hard reset” and a “soft reset”. Their build executes a reset by shorting various cartridge pins to ground (more on this in the testing section below). The second source I found was a 2017 forum post on sega-16.com by “Thunderblaze16”. 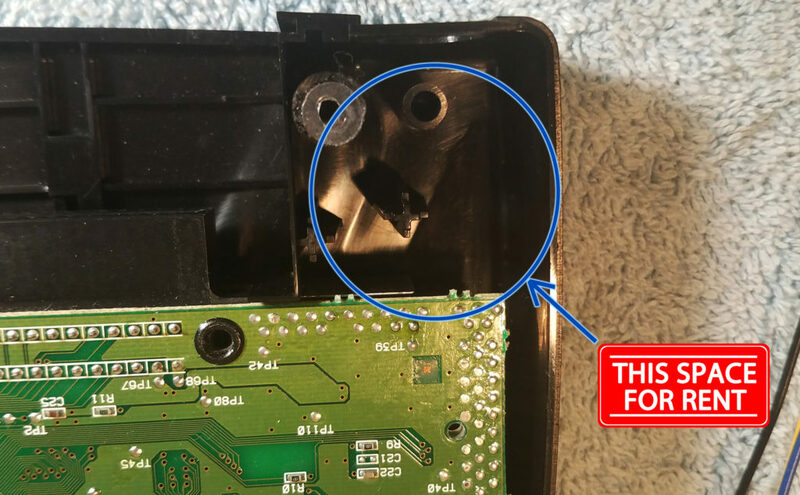 He used a similar method as above, except instead of the cartridge pins, a pin from the “SEGA 315-5684” chip is grounded. 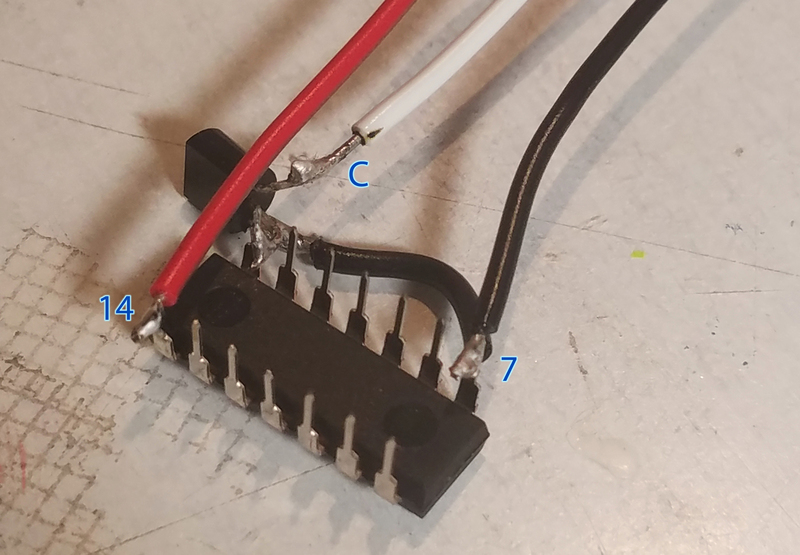 According to console5.com (a great resource for console hardware information), this is the Nomad’s audio/headphone amplifier, so I’m not sure why he chose to connect here, nor do I understand why it appears to work in his video, but either way the result is a hard reset, which is not my goal for this project. *A quick note: the Nomad uses “active-low” logic, which means that logic “high” is when the voltage measures 0V, and logic “low” is when the voltage measures 5V. 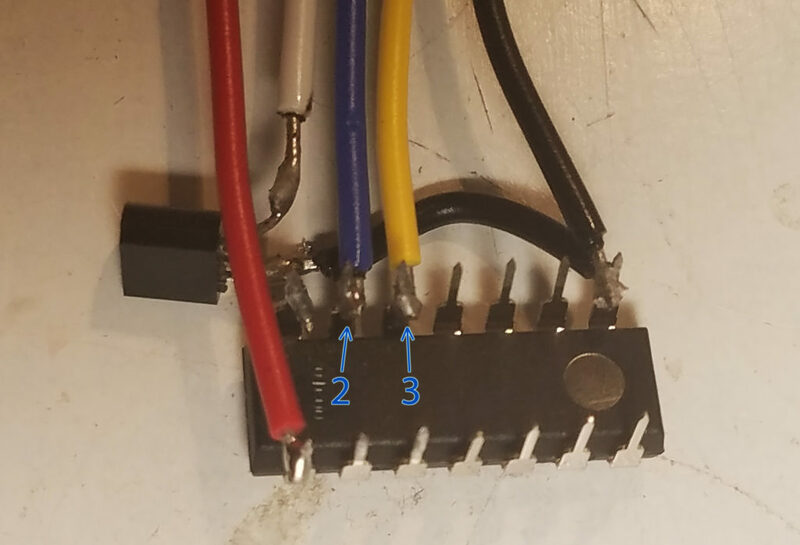 This means that all “inactive” pins (logic low) are already at 5V, and in order to “activate” a pin, it must be pulled down to 0V (logic high) by shorting it to ground. 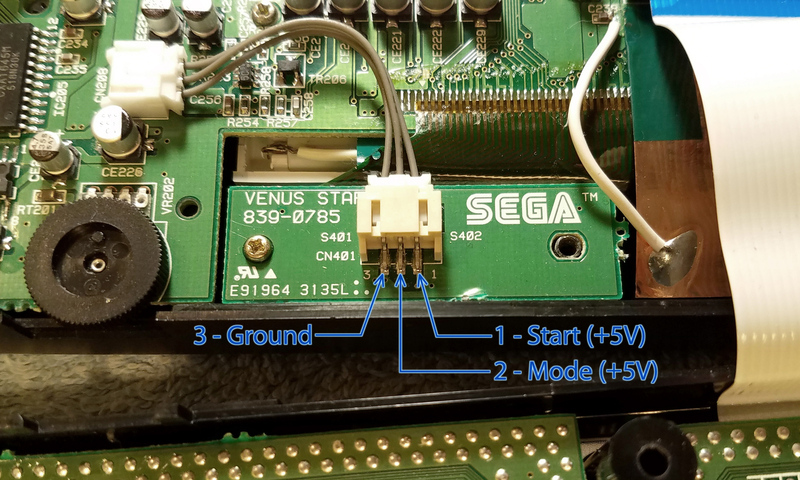 Testing their functionality across several games, pin B2 successfully performed a hard reset, returning the Nomad to the initial “Produced by or under license from Sega…” message, however pin B30 would not perform a soft reset with any cartridge, even my EverDrive X7. Based on princemoonrise’s post and pictures, it looks like their soft reset button is also somehow wired to the SMS mod on the reverse of the board, though there aren’t details as to how, but it would seem that this pin probably only works with SMS games. Going back to the pinout diagram, there is one remaining reset pin, B27 (!RESET). Testing this pin with each of the above cartridges, all games successfully reset the Nomad past the “licensing” message, starting at the Sega logo. This appears to perfectly mirror the function of the Genesis’ physical reset button. Like the rest of the system, these buttons use active low logic, so they measure 0V when pressed, and 5V when not pressed. This design only needs one gate, but the only through-hole style chip I could find is a 4-in-1. There are surface mount versions available with just a single gate, but they’re far too small to work with by hand, so we’ll just have three extras. To short pin B27 to ground, we’ll use a BJT NPN transistor. There are plenty of sites that can explain them far better than I, but put simply, type BJT transistors can be used as (among other things) an on/off switch. 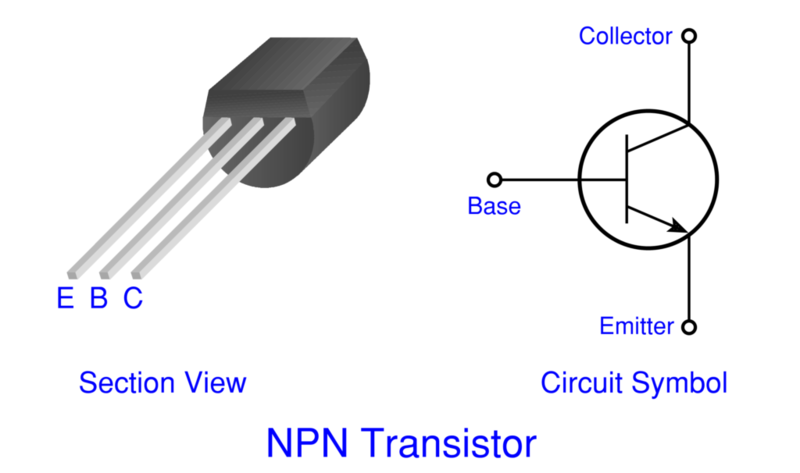 Sub-type NPN transistors detect voltage at the base (B) terminal, which then allows current to flow from the collector (C) to the emitter (E). 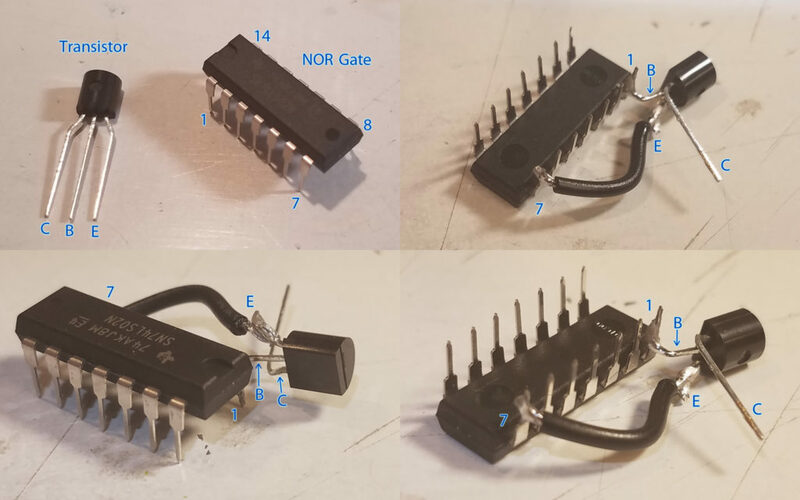 Note #1: The NOR gate still requires its own power connection to operate (VCC & GND). The power consumption is so small, though, that it doesn’t have a measurable impact on battery life. Note #2: You would normally want a resistor ahead of the transistor’s base pin to limit the incoming current, but by my measurements, its so low already that one is unnecessary. *Normally you would want a resistor at the base of the transistor to limit the incoming current, but the current is so low already that it’s unnecessary. The colors of the wires don’t actually matter, it just makes them easier to identify in these pictures. Now it’s time to mount this assembly inside the Nomad. I recommend using a dab of hot glue to affix it in place, but this is a temporary mod for me, so I’ll just be taping it down. I tucked the yellow & blue wires in the side below the bottom circuit board. These wires will lay below the center RF shield (the silver plate), so I covered them with a piece of electrical tape to prevent accidental contact. These wires will simply lay on top of the RF shield when I close the Nomad. 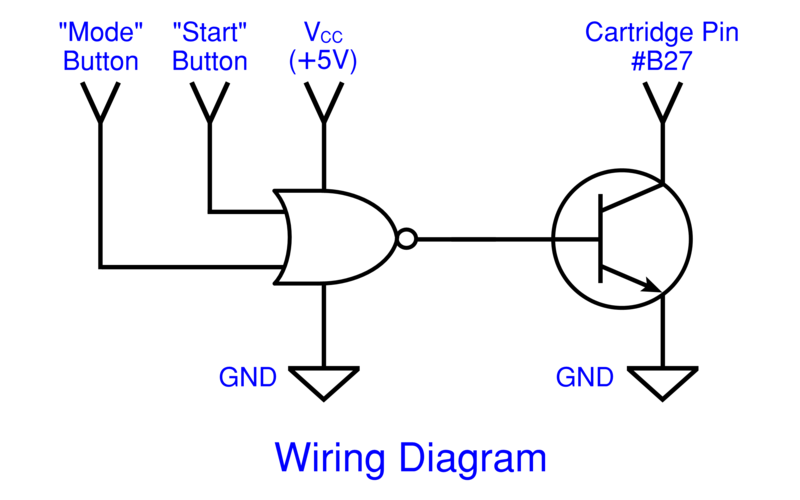 Note: It actually doesn’t matter which wire goes to which button, the logic gate will function the same either way. And that’s it! I closed the system up and grabbed my EverDrive to test it. To really know if this mod correctly mirrors the functionality of the original Genesis’ physical “Reset” button, I needed to try it with X-Men, since this game actually requires a reset to progress through the story. I’ve never actually played the game before, so I… enhanced my gameplay with some Game Genie codes (…and a walkthrough) to quickly power through to where the reset was needed, and lo and behold, it worked!